Invitations, Tableware & Cloths, Centerpieces, Favors, Balloons, Sterno and Racks, Candles, All Decorations, Wicker Chairs, and Wishing Wells for renting.We have so many items, there are too many to list here. Browse through the rest of our site to see more of what we have available for you. Having a themed party, Family Reunion or BBQ? You will be pleasantly surprised at our fantastic selection of theme-builders and decorations. 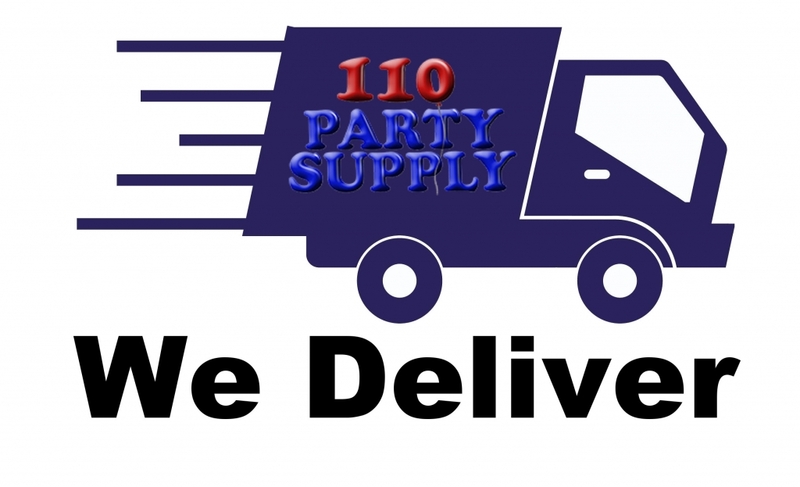 From Luaus, Fiesta themes, Rock & Roll 50’s, and Disco 70’s parties, to Casino & Card Nights, Hollywood and Red White and Blue Patriotic gear, 110 Party Supply has it all. 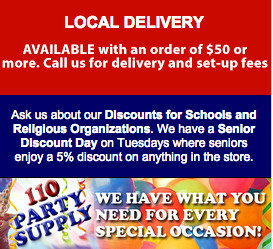 We also carry the newest trends in tableware and balloons. Come in and check out all the hottest licensed characters we carry for your children’s parties. Then let us help you plan the perfect experience for all. Older kids can come check out our Team Spirit section and get fun gear in their school colors to wear to the game, Homecoming events or Spirit Week. Located on Route 110 in Melville, Long Island we have a tremendous selection of balloons with over 300 hundred on our balloon wall. See our balloon section here on the website for more information about our balloon bouquets and centerpieces. If you do not see what you want, ask us about it and we will look in our catalogs to see if we can accommodate you with a special order. Make sure to ask our staff how long your special item will take to come into the store. You are always welcome to browse around our store and we always appreciate your business. Great customer service is on the top of our list! Thank you for shopping local.